bottle, wiring harness with Rocker Switch, hardware and mounting brackets. 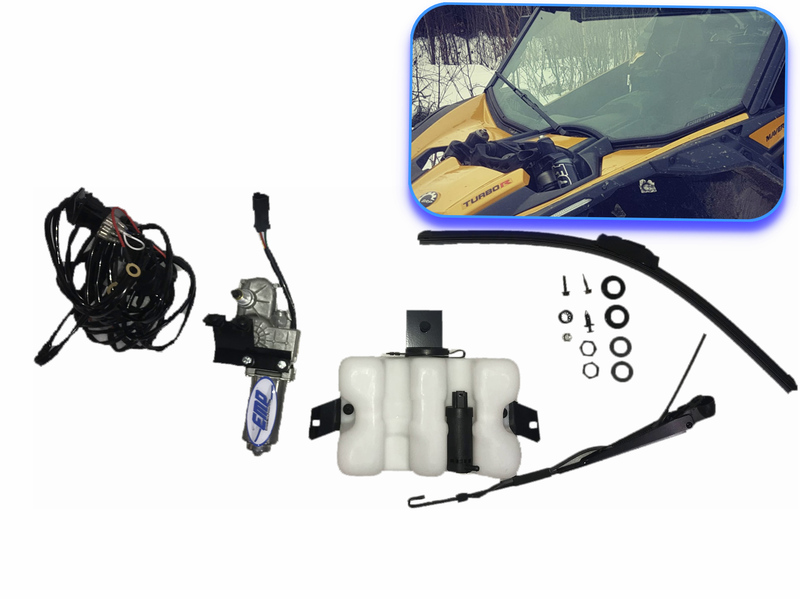 * Single Rocker Switch operates motor and washer from your dashboard. * Same quality parts used in Automotive systems. but for less. Compare to similar factory wiper here . * Designed and assembled In Cleveland Ohio. * Eligible for free shipping to the lower 48 states.The motor mounts under the hood plastic with supplied brackets. Large 21″ wiper blade provides maximum sweep. Automotive quality. Single dash mounted rocker switch fits rectangle rocker switch cut outs in the X3’s dash. Will work with EMP(r) P/N: 13348 Hard Coated Poly-carbonate windshield, Can-AM P/N: 7150022908 Hard Coated Poly-carbonate Windshield Can-AM P/N: 715003281 Glass Windshield. Not recommended for non-Hard Coated windshields. If using on a Hard Coated windshield do not use ammonium based washer fluid. We reserve the right to make modifications/improvements to our products at any time. Vehicles may have changes throughout the year. Therefore, pictures are a representation of the product you will be getting but may vary due to product revisions. Items that are returned will not have the original shipping costs returned and are subject to our terms and conditions.